Home » Iran » Hard-Liners Agree: Good Riddance to Iran Nuclear Deal! Charles Kurzman, “Hard-Liners Agree: Good Riddance to Iran Nuclear Deal!” June 1, 2018. Hard-liners in Iran agree with the Trump administration: The Iranian nuclear accord was a terrible deal, and never should have been struck! They were relieved when President Trump announced on May 8, 2018, that the U.S. government would reinstate sanctions against Iran, in violation of the 2015 Joint Comprehensive Plan of Action (JCPOA). Trump’s decision vindicated their own longstanding demands that Iran exit the agreement as well. 1. Hasty entry into the nuclear issue, believing in a quick end to the sanctions [on Iran]. 2. Trust in America and the West, overlooking their damnable sword [?] and betrayal. 3. Inattention to experience and efforts of previous [nuclear] negotiating teams, overlooking their valuable achievements. 4. Underestimating domestic strength, linking all economic weaknesses to the removal of sanction and the effort to obtain an agreement of any kind. 6. Treating the nuclear industry as worthless and generously trading it away, to the astonishment and delight of Javier Solano, the former foreign minister of the European Union. 7. Weakness of expert support and insufficiency of specialist abilities on the negotiating team, especially in the economic domain, and lack of competency on the complicated puzzle of the removal of sanctions. 8. The influence of espionage agents on the [Iranian] negotiating team, guiding the terms of the agreement on behalf of the enemy’s demands. 9. 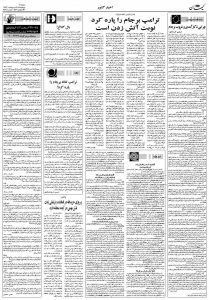 Preparation of the draft agreement in advance by America and efforts by the [Iranian] negotiating team to fill in the blanks, content to edit and publish the text of the agreement in English (not Persian), contrary to contemporary norms of [international] agreements. The other side cannot be trusted. The other side is a threat to our system of government and our way of life. Spies and moles have infiltrated our foreign policy establishment. Because of this treachery, the other side got a better deal. We will be better off without the deal. This is not the first time that hard-liners on opposing sides of world affairs have aligned on a mutual pact of aggression. We saw a similar dynamic in the provocations of 9/11 and the overreaction of the Bush administration, for example. Hard-liners feed on the threats of opposing hard-liners. Meanwhile, the vast majority of Americans and Iranians would like to get along, despite our differences. The challenge is how to sidestep hard-liners who benefit, together, from hostile rhetoric and heightened tensions.